Sutton was physically removed from the plant by police, but the result of her actions was staggering. The Amalgamated Clothing and Textile Workers Union (ACTWU) won the right to represent the workers at the plant and Sutton became an organizer for the union. In 1977, Sutton was awarded back wages and her job was reinstated by court order, although she chose to return to work for just two days. She subsequently became a speaker on behalf of the ACTWU and was profiled in interviews on Good Morning America, in The New York Times Magazine, and countless other national and international publications during the late 1970s and early 1980s. “Sally Field did one heck of a job,” said Sutton about the 1979 film Norma Rae, based on her story. 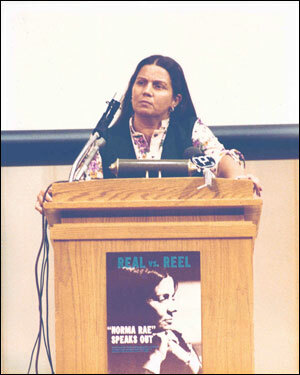 Although her name, as well as others, was changed due to legal reasons, she said most of what is portrayed is accurate. It won Sally Field an Oscar, a Golden Globe and the Best Actress award at the Cannes Film Festival. The Crystal Lee Sutton Awards, established in her name a few years ago, recognize individuals and organizations whose efforts have contributed to presenting positive images of working people to the American public. Sutton, who matriculated through Alamance Community College’s Nursing Assistant program in 1988, said she chose the College as the repository of her papers because of its record in providing education for all people. She says she has been collecting material since she began her crusade for unionization in 1973 and wanted to ensure it was preserved for future historians and students.